Conveyor Belt Weighing Systems	ConveyWeigh, LLC. ConveyWeigh, LLC offers Weigh Belt Conveyors, complete custom built Weigh Belt Conveyors, of any length, with any type idlers, or pan styled belt support systems. Often a single idler, two idler, three idler or four idler belt scale will be utilized depending on accuracy requirements. 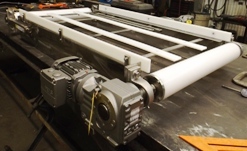 Our custom built Weigh Belt Conveyors provide outstanding accuracy. 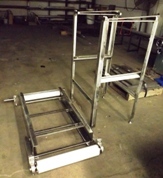 These weighers are incorporated into a custom conveyor design per application. Variable drive, load cells and complete conveyor wash down features available. Each conveyor will be equipped with a high resolution, 1000 pulse per revolution absolute speed encoder and will be wash down stainless steel construction. Each conveyor is equipped with a Convey Weigh “Belt Pro” integrator with at least 4 load cell inputs, high resolution speed input, Ethernet rate output to PLC options, pulse type totalizer output options and all standard weigh belt scale and calibration software features. Wash down rated and NEMA 4X construction rated. FDA approved belting etc available. Analog or digital outputs to PLC. Custom controls, software, and multiple output PLCs available. Wifi, PC, Tablet & smart phone ready. Wireless or hard wired direct to PC from scale weight integrator. Multiple data outputs, RS 232, RS 485, Cat 5 – T- 10/100, USB-memory stick, 4-20-Ma 0-10v etc. Custom programming data software available. PLC Ready. PLCs available. Commonly utilized for Plastics, Bulk Foods, Recycling, Concrete, Cement, Aggregates, Grains, Fertilizers, & all dry powders etc. Drawings to specifications for approval offered. Call for pricing and more info.